From the early days of the church there existed in the Catacombs representations of Jesus, the Blessed Virgin, and the Martyrs, and the fact that they were adorned with haloes is a clear indication of the veneration with which they were regarded by the faithful. The historian Eusebius specifically mentions a bronze statue erected in honour of the Saviour, before which the faithful prayed and were sometimes awarded with miracles. Contrary to the accusations of some Protestants, therefore, this practice is not a novelty introduced by the Roman Church. Moreover, the honouring of images is not idolatry because it is not a direct adoration, but a relative and indirect veneration. Homage is not paid to the actual statues or pictures, but to Christ, the Blessed Virgin and the Saints, whom the images represent. The cult of images has, therefore, a solid theological foundation. "We make images of holy men," as St. Cyril of Alexandria expressed it, "not to adore them as Gods, but as a reminder and a stimulus to ourselves to imitate them. Moreover, we make images of Christ so that our love for Him may be more easily aroused. ", (In Ps., 113:16) Besides being theologically correct, the practice is also useful. 2. The opposite extreme of over-superstitious veneration of images must also be avoided. As St. Gregory the Great observed, sacred images should be regarded as a means of impressing on simple minds the virtues which they ought to emulate. Sometimes, however, the ignorance of the faithful in this regard needs to be corrected. It is not unusual to enter a church and to see crowds of people around statues of the Blessed Virgin and the Saints, laying flowers at their feet and lighting innumerable candles. Meanwhile, the Altar of the Blessed Sacrament is deserted. Excessive homage can be paid to particular images, in such a manner as to suggest that the piety of the worshippers is directed towards the material images themselves rather than towards the Redeemer or our Divine Mother or the Saints. We must be careful to ensure that our devotion does not become corrupted by superstition. 3. Apart from avoiding the two extremes of behaviour which have been mentioned, we should cultivate a proper respect for the images of saintly men who have benefited mankind. If we can cherish so dearly the portraits of our parents, how much more should we revere the images of Christ, Our Lady and the Saints? We should kneel before them and imagine that the loved ones are present whom they represent. As we are praying, we should remember the virtues of those to whom we pray and resolve to follow in their footsteps. "Nowhere did Christ order that even the briefest word be written about Him. 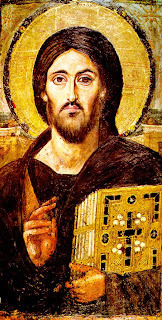 Nonetheless, His image was sketched in writing by the apostles and preserved for us to the present. So, what is represented on the one hand with paper and ink, is likewise represented on the icon with various colors and different materials." "...from the moment Christ is born of a Mother who can be depicted, He naturally has an image which corresponds to that of His mother. If He could not be represented by art, this would mean that he was not born of a Mother who can be depicted, but was born only of the Father and that He was not Incarnate. But this contradicts the whole divine economy of our salvation." "If you have understood that the Incorporeal One became man for you, then it is evident that you can portray His human image. Since the Invisible One became visible by assuming a human body, you can make a picture of Him who was seen. Since He who has neither body, nor form, nor quantity nor quality, who transcends all grandeur by the very excellence of His nature, who, being of divine nature, assumed the condition of a slave, "He thus reduced Himself to quantity and quality by clothing Himself with human features; therefore, paint on wood and present Him for contemplation, who desired to become visible."